On Wednesday the Inspector-General of Police, Ibrahim Idris, who was expected to appear before the lawmakers, failed to do so. What are the issues? It was the second time in two weeks that the police boss would fail to appear before the Senate to answer questions over the arrest and detention of Senator Dino Melaye as well as the spate of killings across the country. The IG had sent the Deputy Inspector-General of Police (Operations), Joshak Habila, to represent him last Thursday. The police boss was said to have accompanied President Muhammadu Buhari to Bauchi State. The lawmakers had turned down his representative, insisting on his appearance. On Wednesday when the Senate got to the IG’s briefing as the next on the list of items on the Order Paper, the Senate President, Bukola Saraki, asked the Clerk of the Senate, Nelson Ayewo, to bring the IG into the chamber. After going out and returning to the chamber, the clerk informed the Senate President that the police boss was not around but had sent Habila to represent him. “The Clerk has just reported back to me that the IG is not present and the thing looks like it is a DIG (sic),” Saraki said. After angry senators had discussed Idris non-appearance, Saraki noted that no IG had ignored invitation from the legislature since Nigeria began to practise democracy. “I don’t think that this has ever happened before,” he said. He recalled the act of insubordination by the IG when the President asked him to relocate to Benue State over the killings there but it was later announced by Buhari that the police boss failed to execute his order. Saraki said, “No IG has ever refused to appear before the Senate since we started practising democracy. I don’t think that has happened before. But we must know that these actions are a danger to our democracy. The Senate President later asked the Majority Leader, Ahmad Lawan; and the Chairman of the Committee on Police Affairs, Senator Abu Ibrahim, to engage with the executive on the matter. The Senate President had earlier asked the Chairman of the Senate Committee on Police Affairs, Senator Abu Ibrahim, who was asked to facilitate the IG’s appearance, to explain the IG’s non-appearance to the chamber. Ibrahim said efforts by him to reach out to the police boss failed, adding that despite his plea to the DIG to persuade the IG to appear on Wednesday, the police boss still failed to come forward. Saraki asked the lawmakers to make comments on what the Senate should do but there was silence in the chamber. Later Na’Allah rose to say he was shocked by the IG’s non-appearance. He read Sections 88 (1) and (2) and 89(c) as empowering the lawmakers to summon the police boss. He however did not state to whom the displeasure would be registered. 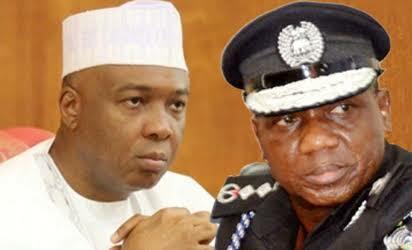 Na’Allah added, “To me, something has to be done and I think what needs to be done is that we need a delegation of this Senate and possibly under you (Saraki) to register the displeasure of the Senate over the non-appearance of the Inspector-General of Police on the two occasions when he was invited into this chamber. “…If we begin to have these kinds of conducts, I would say, with due respect, that it is affecting our collective effort to assist Mr. President. I apologise to my colleagues for this very unusual behaviour.